NEW YORK (CNNMoney) -- Private sector payrolls soared in December while downsizing sank, two separate reports showed Wednesday in a strong indication of a brightening U.S. jobs picture. 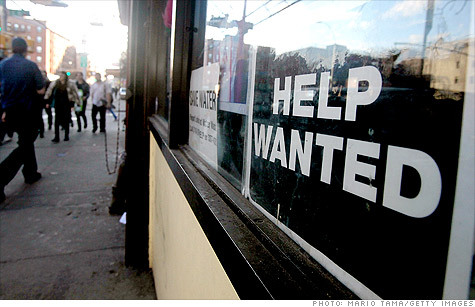 Payrolls among private employers rose by 297,000, payroll processor ADP announced. That's the biggest gain since the report was first issued in 2000 and was much larger than expected. Economists surveyed by Briefing.com were forecasting a rise of 100,000 jobs. ADP's report typically sets the tone for the the government's highly anticipated monthly employment data. The latest report, due Friday, is expected to show employers boosted payrolls by 146,000 last month, following a 39,000 increase in November, according to a CNNMoney survey of 27 economists. "The ADP report was robust and implies a solid gain coming Friday," said Robert Dye, a senior economist at PNC Financial Services. "But it's not just this one report that implies that -- the whole suite of labor market indicators are starting to turn north now." Hiring by private employers was led by the services sector in December, with employers adding 270,000 jobs in December. That's the sector's highest jump on record and the 11th straight gain, the payroll processor said. Meanwhile, jobs in the goods-producing sector climbed by 27,000, the largest increase since February 2006. Small and medium-sized businesses dominated the advance. Small businesses -- those with fewer than 50 employees -- added 117,000 workers last month, according to ADP, while medium-sized companies with between 50 and 499 workers -- added 144,000. "Small businesses in particular are feeling more comfortable about hiring, and that's where we're going to start seeing the ongoing gains," said Dye. Too good to be true? While agreeing that the labor market is showing signs of improvement, some economists said seasonal factors may have distorted the latest ADP data, giving the number an artificial boost. ADP measures the number of employees on payrolls at a given time. Since many employers keep former workers on their payrolls through the end of the year for tax purposes, employees begin rolling off in December. ADP seasonally adjusts for that change, which can cause distortions in the data. "In any given December, we'll put a little less weight on the ADP number," said Zach Pandl, an economist at Nomura Global Economics, adding that the three largest surprises in ADP data have occurred in December. Joel Prakken, the chairman of Macroeconomic Advisors, which compiles the ADP data, acknowledged the difficulty of adjusting for seasonal factors but said he still viewed the report as a good omen for Friday's government jobs report. "I'm telling my clients to approach the number with appropriate caution, but even after you have exercised that caution, there is a recent strengthening in ADP numbers," he said. "If my forecast for the jobs report Friday was at consensus before the report, I would give serious consideration to moving it higher." Job cuts on the decline: In another sign that the weak job market might have bottomed out, 2010 was the lowest year for job cuts in 13 years, according to a separate report issued Wednesday. Employers announced plans to cut nearly 530,000 jobs in 2010, a 59% plunge from 2009, when job cuts reached a seven-year high, said Challenger, Gray & Christmas, an outplacement consulting firm. It was the lowest number of announced cuts since 1997, when 434,000 job cuts were announced. Challenger also reported that job cuts plunged 34% in December to 32,000 from nearly 49,000 the month before. That was the lowest monthly job cut total since 2000. Last year's holiday-season job cuts were less severe that the year before. Job cuts in December 2010 were 29% lower than the year-earlier level of about 45,000, according to the report.